Off to the right you’ll notice my filing cabinet and above that my whiteboard, and that’s the first project I’ll be discussing. I got the idea from Dave’s post over at Mind Petals and decided to put the plan into action. Click below to keep reading. First thing you need to do is make sure you’ve got the room. This thing is huge, measuring in at 4′ x 8′. You can find everything you need at Lowe’s or Home Depot. The board is often referred to as shower board or tile board, and I found it in the paneling section. You’ll need the following tools and supplies for this job. Begin by having a friend help you hold the board against the wall. 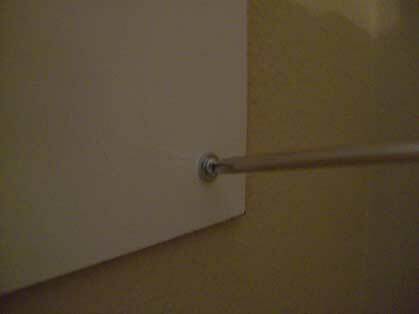 Using your drill, punch a small hole through the board and into the wall to make your marks. 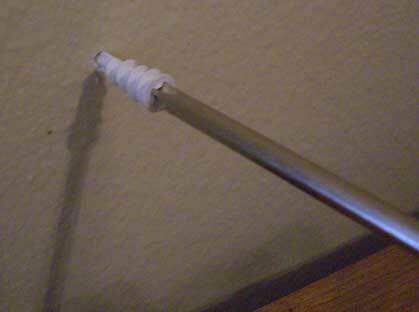 Now insert your drywall anchors into the your predrilled marks. You’ll need to get your buddy to help out again. Move the board into place over your anchors and insert the screws. It’s really that simple. 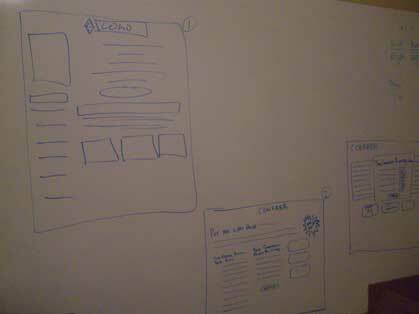 For under 20 dollars you now have a massive dry erase board, perfect for brainstorming or storyboarding your next project! The next project is really useful for those with cheapo desks that have wide open areas underneath showing off your mess of cables. Here’s a before picture. 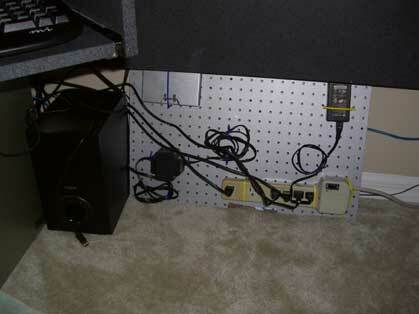 Simply take your junk wires and using the zip ties, strap them to the pegboard. 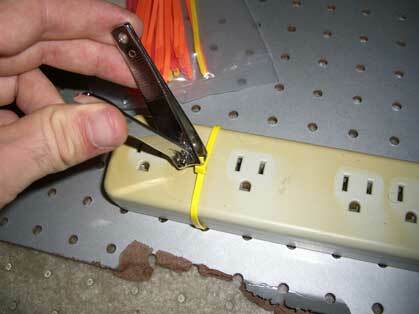 Use your nail clippers to trim the zip ties down to a manageable size. Again, I got lazy and just tucked it away, but you can make things look really clean by screwing it the the bottom of your desk so that it’s completely out of site. 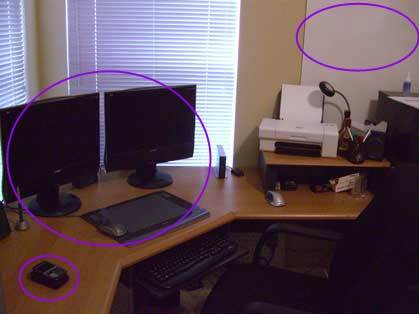 If you have any suggestions or photos of your ultimate home office, feel free to send them in! Great post 🙂 – I’m subscribed to your rss feed as of yesterday. Welcome aboard Ron, glad to have you as a subscriber. Be sure to tell your friends to join! 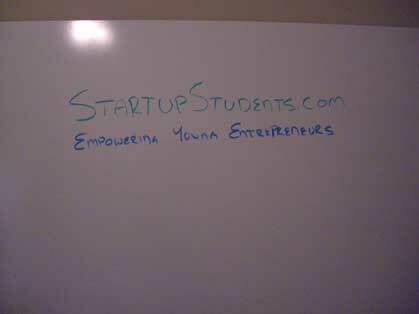 I went through your site, are you a college entrepreneur as well? Great idea using the peg board to tidy up all the wires. This is a must do project for me now. 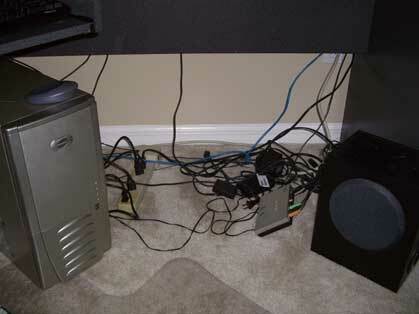 I have spaghetti-wire syndrome and need to tidy this up. Thanks for the idea. Will recommend the idea to my readers. Hey Brett, I just had a quick question for you. Do you have problems erasing stuff from your board? I just hung mine up finally after it sitting against the wall for a week and the first thing my roommate wrote was “POOPY” and not is seems to be burnt into the board. I used the dry erase marker spray stuff but it didn’t take it all off, so you can still see what it said. Any tips for keeping it clean? Chris I’ve actually had great success with the Expo dry erase board cleaner and an abrasive towel. I’ve had stuff on there for weeks at a time and it still comes off with a little elbow grease. I’ll have to dig up an article I saw outlining all the types of cleaners and what works best tomorrow. Interesting. I’ll have to check the brand of the stuff that I have. I was also going to try some regular glass/window cleaner like windex to see if that will work any better. One of my friends did this a couple years ago and he had this same problem. Ill have to keep trying it out I guess! If you really want to make those wires look nice you can actually mount that pegboard up on the wall, between the desk and the wall. You can also try framing it, or use project boxes to coil up the wires into. Lots of ways to make that good idea even better. Yea, I agree. In fact, my original plan was to mount it under the desk and out of sight. However, I chose this route for a little easier access. I’m moving next week, and plan on taking this solution to the next level. I’ll be sure to post pics for you guys.